Howard Johnson was a solid major-league player for several years. He was probably best known for a combination of power and speed that made him the darling of fantasy baseball owners as that variant of the national pastime took off in the 1980s. He was a member of two World Series championship teams, the 1984 Detroit Tigers and the 1986 New York Mets. Johnson played several positions while growing up. He was a natural left-hander, but his father taught him how to throw righty so that he could have more positions to play; it was a skill that served Johnson well not only on the sandlots but throughout his pro career. A graduate of Clearwater High, he was drafted by the New York Yankees in the June 1978 draft in the 23rd round as a pitcher, but he did not sign. He was drafted by the Detroit Tigers with the 12th pick of the first round of the January 1979 secondary draft as a relief pitcher, but the Tigers moved him to shortstop. Johnson played for the Lakeland Tigers of the Class-A Florida State League in 1979. After a few games at short, the Tigers moved him to third. His main offensive statistics in his rookie season were not great (.235 average and only 18 extra-base hits), but he showed fine strike-zone judgment playing in a good pitchers’ league, with 69 walks in 132 games. He also made 36 errors at shortstop and third base, which led to a move to the hot corner in 1980. Johnson spent a second season in Lakeland in 1980 and did much better, slamming a league-leading 28 doubles, hitting .285 with 39 extra-base hits, stealing 31 bases, walking just about as often as he stuck out (73 walks and 75 strikeouts), and slicing his errors to 13. He was named the third baseman on the Florida State League’s postseason Northern Division All-Star Team. Johnson followed that up with a strong showing in the Florida Instructional League, cementing his status as a big-league prospect. The 1981 season was a breakthrough year for Johnson. Playing for the Birmingham Barons of the Double-A Southern League, he hit 22 home runs and drove in 83 runs, with his 75 walks helping him to a .360 on-base percentage. He received notice for a two-homer game on May 25 – one of them a broken-bat homer, a rare event in those days. After the season Johnson returned to the Florida Instructional League and hit .331. That fall the Tigers added him to their 40-player major-league roster. Johnson went to spring training in 1983 fighting with Tom Brookens for the regular third baseman’s job. Manager Sparky Anderson liked Johnson’s bat but was concerned that his glove needed more work, after he fielded .901 at third base for the Tigers in 1982. (Part of the problem was that, amazingly, he was using an outfielder’s glove at third base.) When the season started, the plan was to platoon Johnson and Brookens, but soon the right-handed-hitting Brookens was given all of the starts against lefties while they split the starts against right-handers. Johnson was also thought to be so tense that it affected his play, a charge that would dog him during his years with the Tigers. Johnson was hitting .212 in 27 games when he was sent back down to Evansville on May 27. (Ironically, his best game of the season with the Tigers was his last, a 2-for-4 game with a home run, two RBIs, and two runs scored.) He played only three games with the Triplets before he suffered a broken finger on June 1 and then a refracture on June 24 that eventually led to season-ending surgery. After the season the Tigers signed third baseman-first baseman Darrell Evans, the club’s first big free-agent deal ever, so Johnson was sent to the instructional league to work on his outfield play. The 1984 season started with another competitor for the third-base job, outfielder Glenn Wilson, whose poor fielding ended that experiment, helping lead to one of the biggest spring-training trades in Tigers history: Wilson and catcher John Wockenfuss to the Philadelphia Phillies for reliever Willie Hernandez and first baseman Dave Bergman. That did not give Johnson the third-base job permanently, as Anderson was still enamored of Brookens’ glove, and at times both Barbaro Garbey and Marty Castillo were front-runners as well. Johnson started at third on Opening Day in Minnesota, and for a while he and Brookens platooned until players like Castillo and Garbey started to get some playing time near the end of the Tigers’ 35-5 start. Johnson played in 20 of those 40 games, and while he hit only .265, his 10 walks led to a .383 on-base percentage. Though the Tigers were able to cruise to the pennant, Johnson struggled. In early June he won the everyday third-base job, starting 72 games in an 80-game stretch, but hit only .234 and started only nine of the final 35 games. There were whispers that Anderson still did not have confidence that Johnson could play under pressure. There was a story told of a late-season game in which Anderson, picking a pinch-hitter, looked down the bench, and when his eyes met Johnson’s eyes, Johnson looked away. Johnson played in only one of the Tigers’ eight postseason games, coming in for defense in the final game of the World Series, getting one hitless at-bat. It was clear that he was on the outs in Detroit. However, one club was hot after the 24-year-old, and that club could help fill a hole for the Tigers. The New York Mets had been asking about Johnson for a couple of years, and their interest intensified when they were working on a deal with the Expos for Gary Carter. Part of the price in that trade would be Hubie Brooks, so they felt they needed to get a replacement infielder. The Tigers needed starting pitcher Walt Terrell after it was clear that Milt Wilcox’s arm was shot, so Johnson was traded to the Mets for Terrell in December. Unfortunately for Johnson, he was moving from one crowded third-base situation to another, as the Mets also had Ray Knight to man the hot corner. In his book Bats, Mets manager Davey Johnson (no relation) talked a lot about how to get both third basemen playing time without harming either player’s confidence. It did not help that HoJo got off to a terrible start, his average bottoming out at .127 on May 5, or that Terrell began his Tigers career by going 5-0. Johnson started hitting a little better, but did not get his average above .200 until an epic 19-inning victory over the Atlanta Braves that started on Independence Day and ended close to 4 A.M. on July 5. Johnson did not even start that game; he entered in the ninth inning as a pinch-hitter for shortstop Rafael Santana, got a single, and scored the tying run. He blasted a two-run homer in the top of the 13th and hit a single and scored the lead run in the 18th, but both times the Braves battled back to tie the score. In the Mets’ five-run 19th that finally finished off Atlanta, Johnson was intentionally walked and later scored. That game and an injury to Knight got Johnson the starting job in July, but he did not hit and Knight recovered, so the platoon arrangement returned. The Mets and the Cardinals battled all season, trading the lead back and forth, but the Cards eventually pulled in front for good, and despite a 98-64 record, the Mets were on the outside looking in when the playoffs began. During the winter, Johnson moved to the New York area, got his broker’s license, and took a job on Wall Street. The plan for 1986 was the same as for 1985 – a third-base platoon for the Mets – but Knight hit six home runs in his first nine games to win the job full time. Johnson was shifted to shortstop, the first time he had played the position regularly since his first year in pro ball. He hit a pivotal pinch-hit two-run homer on April 24 off the Cardinals’ Todd Worrell to tie the game in the ninth inning in the first game of a big four-game set between the Mets and St. Louis. The Mets scored a go-ahead run in the top of the 10th, and Johnson’s error at short put on the tying run with nobody out, but Roger McDowell held the Cards at bay. Johnson was hurt on June 1 when he and Lenny Dykstra collided on a fly ball; he suffered a hairline fracture of the right forearm that kept him out of action for 21 games. In his first game back he hit two home runs, and even though the Mets lost, they were 46-20 and in first place by 9½ games. Johnson did not return to short after he came off the disabled list and played in only 56 of the final 97 games, with just 29 of them starts. He hit nine home runs in 135 at-bats during that stretch but his average was only .237 (even though his frequent walks led to a respectable .331 on-base percentage). The Mets won 108 games, finishing in first by 21½ games, and beat the Houston Astros and Boston Red Sox in two of the most exciting postseason series in baseball history. Johnson pinch-hit in two games against Houston and in the ninth inning of Game Six of the World Series. He played the entire second game of the Series, going 0-for-4. (He was also hitless in his other games.) Johnson was involved in a controversial situation in the Houston series when he and Mets catcher Ed Hearn produced balls they claimed had been scuffed by Houston starter Mike Scott, who had a reputation for helping himself in such ways. The winter brought rumors of Johnson going to San Diego as part of a trade for slugger Kevin McReynolds, but Kevin Mitchell ended up being the biggest hitter who went west in the deal. Knight left the Mets for the Baltimore Orioles as a free agent after winning the 1986 World Series MVP award, but that did not mean Johnson had inherited the third-base job. Rookie Dave Magadan was the new competition in 1987, but Magadan needed surgery late in spring training for swollen lymph nodes, leaving the job to Johnson. He was hitting only .220 with two home runs in 18 games when Magadan returned and was given the third-base job, but Rafael Santana was the odd man out as Johnson moved to shortstop briefly. Johnson soon moved back to third, and for the first time since his rookie season in 1982, he had a really hot streak – five home runs in 17 games in May. So even though he went homerless in the next 15 games and hit .178, he stayed in the lineup. It was the first time in Johnson’s career that he was able to go through a rough stretch without being yanked from the lineup, and he took advantage of the situation. Johnson hit three home runs in April, five in May, seven in June, and a whopping 10 in July, giving him 25 home runs with two months to go in the season, which attracted a lot of attention. He wasn’t the only one; home runs in the majors were up 17 percent in 1987. It was the story of the summer, and Howard Johnson was the poster boy for the home-run surge. On July 28 he became the third Met to reach the 20/20 (home runs/stolen bases) plateau. It happened in the first game of a three-game series against the Cardinals that vaulted Johnson onto the national stage, a surprise to many people in that he had stolen only 31 bases in his five previous major-league seasons. The Mets had been playing a little over .500 ball all season and entered the series in St. Louis 7½ games back, but the Mets swept the Cards to pull within 4½ games of their nemesis. In the second game of the set, HoJo went 4-for-5 with a home run, and his two-run homer in the eighth inning off Bill Dawley the following day led the Mets to the sweep. The controversy continued. Johnson’s bat was confiscated by umpire Dutch Rennert when Giants manager Roger Craig accused Johnson of using a corked bat to hit his 30th home run of the season on August 19. Craig said, “When a man hits a ball 480 feet, I have to take a precaution. I knew HoJo well when I was with Detroit. He really hit that ball, and I don’t recall him hitting them that far in Detroit.”4 The bat was X-rayed and Johnson was exonerated. Later, Montreal manager Buck Rodgers added his name to the list of skippers accusing Johnson of cheating. The allegations were never proved. Johnson and Mets general manager Joe McIlvaine attributed Johnson’s newfound power to his opportunity to play every day. When Knight left the Mets, Johnson said, he spent hours in the batting cage hitting right-handed to prepare himself for the full-time job. It also might have helped Johnson to know that he was secure as the team’s third baseman; there was no Tom Brookens, Glenn Wilson, or Ray Knight available if he had a bad week. After all, he started taking off in May after a slump that in the past might have put him on the bench. The sweep of the Cardinals helped jump-start the Mets and they closed to within 1½ games in early September, but they ran out of gas and ended up in second place, three games back, with a 92-70 record. It ended up being a red-letter season for Johnson, who hit 36 home runs, stole 32 bases, and drove in 99 runs. He became the eighth player in major-league history to post a 30/30 season. He broke the record for home runs by a National League switch-hitter, formerly held by Rip Collins, who hit 34 home runs for the 1934 Cardinals. Johnson headed to camp in 1988 with a regular job sewed up for the first time, but he started off slow in spring training, with a .115 average, until some pointed comments from manager Davey Johnson woke him up. “I haven’t reached my peak yet,” HoJo said. This is another proving year for me. A lot of people don’t think I can do it again, so I’m out to end the skepticism.”6 Johnson got off to a slow start, not crossing the .200 mark for good until May 11, but the Mets were off to a great start, finishing the quarter-mark of the season with a 30-11 record and a 5½-game lead in the National League East. On April 30 Johnson had played a peripheral role in one of the big stories of the season, scoring from second on an infield single by Mookie Wilson in the top of the ninth to put the Mets in the lead for good, 6-5. The play at first was close and umpire Dave Pallone called Wilson safe. In the ensuing argument, Reds manager Pete Rose shoved Pallone, earning him a 30-game suspension. On June 2 Johnson’s 13th-inning home run off Frank DiPino of the Cubs led the Mets to a thrilling 2-1 victory, one of three extra-inning game-winning home runs by the Mets in a five-game span. By the end of July the Cardinals had almost caught up to the Mets, getting to within 1½ games, but the Mets kicked it into gear, quickly lengthening the lead back to six games. In early September their lead hit double digits, and on September 8, Johnson had the first five-hit game of his career in a 13-6 win against Chicago. The Mets finished first with a 100-60 record, and Johnson had a chance to be a regular in the postseason for the first time. However, he would be playing shortstop. 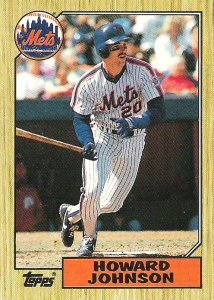 In late August the Mets brought up uber-prospect Gregg Jefferies. Initially, Jefferies was installed at second base, but he later saw substantial time at third base, with HoJo moving to short in place of Santana. It was a move typical of the Mets at the time to try to squeeze as much offense into the lineup at the expense of defense. In the playoffs Wally Backman was the second baseman, Jefferies the third baseman, and Johnson the shortstop. It didn’t work; the heavily favored Mets fell in seven games to the Los Angeles Dodgers in the NLCS. Jefferies hit .333 but between them, Backman and Jefferies drove in only three runs. It was a terrible series for Johnson, who went hitless in the first three games, leading to a benching for Game Four. (He later appeared as a pinch-hitter.) Johnson started Game Five and got his only hit of the series before watching Game Six from the bench. The Mets staved off elimination that day but fell 6-0 in a Game Seven that saw Johnson come off the bench to pinch-hit in the ninth and strike out. It turned out to be the last postseason appearance of his career. It was a disappointing season for Johnson. He hit only 24 home runs, drove in only 68 runs, and hit a full-season career-low .230. That was followed by the playoff problems. He revealed after the season that part of the problem was a sore right shoulder he’d kept quiet about, and he subsequently underwent arthroscopic surgery on October 29. There was also lots of trade talk involving Johnson over the winter, as the Mets tried to clear up the infield logjam caused by the emergence of Jefferies. A deal to send Johnson and others to Seattle for pitcher Mark Langston and others fell through when concerns about how Johnson’s shoulder might heal scared off the Mariners. The Mets also talked with Atlanta about sending Johnson to the Braves. Meanwhile, Johnson worked to put the problems of 1988 behind him, reporting a month early to Port St. Lucie in 1989 to work out with several teammates. Manager Davey Johnson announced that HoJo would be the third baseman and Jefferies would have to learn how to play second. Johnson, though, was still having trouble with the shoulder and did not hit well in Florida that spring. He almost did not leave the Sunshine State a Met; a blockbuster deal fell through at the last moment that would have sent Johnson and Sid Fernandez to Seattle, Mark Langston to Boston, Wade Boggs to Kansas City, and Danny Tartabull to the Mets to give them the right-handed power hitter they craved. It turned out to be the best deal the Mets never made, as Howard Johnson had the finest season of his career in 1989. His 36 home runs and 101 runs batted were not his career best, but his 104 runs scored led the National League and his .287 batting average, .369 on-base percentage, and .559 slugging percentage were all career highs. The season started with the only really good April of Johnson’s career. He had previously hit .203 in April, but in 1989 he hit .333 with four home runs. Unfortunately for the Mets, they continued their pattern of not playing well when Johnson did and vice versa, finishing April with a 12-10 record. That pattern continued all season. At the All-Star break Johnson had 22 home runs, his first All-Star selection, and the first long-term contract of his career (three years for $6.1 million), but the Mets were treading water in third place with a 45-39 record. Johnson celebrated his new contract by hitting two home runs in the All-Star home run contest to help the National League win the competition. Johnson’s 1989 season brought him many awards: the National League Player of the Week for June 19-25, the National League Player of the Month for June (a .340 batting average with 11 home runs), the third-base spot on The Sporting News’ National League All-Star team, the Silver Slugger award at third base for the National League, and the Sport Channel/Leukemia New York Athlete of the Year award. Johnson said upon receiving the latter honor, “It’s amazing. A year ago, I couldn’t have been elected dog catcher in New York.” After the season, he went to Tokyo to conduct hitting clinics. However, Johnson kept his “odd season on/even season off” pattern going in 1990, hitting .244 with 23 home runs and 90 runs batted in. The season also saw him move to shortstop in early August for the rest of the season after regular shortstop Kevin Elster injured his shoulder. The Mets rebounded a bit from their 87-75 1989 campaign, but their 91-71 record in ’90 left them four games behind the Pittsburgh Pirates. Manager Davey Johnson was not around to see them climb back into the race. He was fired early in the season with the club 20-22, replaced by former Met Bud Harrelson, and HoJo lost his most fervent supporter in the Mets hierarchy. But true to the pattern, Johnson had a great season in 1991. He had career highs in home runs (38), runs batted in (117), and runs scored (108). He started the season as the regular shortstop, but was back at third by the end of April. The 1991 season was also the year that Johnson professed his Christianity publicly. He said his wife was already a strong Christian and “a lot had been eating at me. There was the sense of emptiness, that I was missing out on something. I had come up as a baseball player wanting to make a lot of money and enjoy success. I'd done it, but was bothered about where it would go from there.” He vowed that he “certainly [was] not going to forsake my love of the game or my competitiveness in it.” He also switched his uniform number from 20 to 44 before switching back after five games, saying that he was uncomfortable with the new number. Johnson was part of a bigger switch in September when the Mets, still trying to unclog their infield, asked him to play right field. It did not seem to hurt his bat; he got two hits in each of his first three games in right. Johnson welcomed the switch: “This year, for the first time, I felt old at third base. I’m 30 now, and it’s taken a toll on my legs and knees.”7 Even though he played short and right, he was named the third baseman on the National League Silver Slugger team. It was not a good season for the Mets; their 77-84 record was their first losing season since 1983, and Harrelson was fired in late September. The Mets were in disarray, and nothing showed it more than their treatment of HoJo. After playing him at short, third, and right in 1991, new manager Jeff Torborg moved Johnson to a position in 1992 where he’d never played before: center field. Johnson did the best he could, but he did not play well in center, and it affected his bat; in 83 games in center, he hit .224 with only seven home runs. After Johnson misplayed a game-winning triple off the bat of the Dodgers’ Mitch Webster, Torborg moved him to yet another position, left field. The Mets learned from their mistakes with Johnson in 1992 and moved him back to third base in 1993, the last year of his contract. Johnson was concerned about third base wearing him out, but he vowed to work out over the winter to prepare his body for the challenge. At the age of 32, his body was beginning to betray him, however, and word was getting around the league that pitchers could sneak a fastball by him. He was clearly becoming frustrated, as he was ejected from a game for the first time and suspended for three games for bumping umpire Jerry Layne and spinning him around. As it turned out, Johnson was sick with an “acute viral syndrome.” He went on the disabled list to recover, but even after returning three weeks later, in early July, his bat was still not responding. For the second straight year his season ended with an injury to his hand/wrist area when on July 22 he slid thumb-first into second, chipping his right thumb and ending his season – and his playing career with the Mets. With his contract completed, Johnson was a free agent, and two injury-filled unproductive seasons greatly hurt his marketability. After overtures from the Reds, he signed a one-year contract with the Colorado Rockies with a club option for 1995. The Rockies saw Johnson as a player who could give the second-year expansion club power from both sides of the plate and offer defensive versatility. But Johnson got off to his typical slow start, hitting only .133 in April, and by mid-June most of his appearances were coming as a pinch-hitter. His season ended early for the third straight year, but this time it was not because of an injury; in early August of 1994 the players walked out, and the season was over. The Rockies did not pick up Johnson’s option, and after baseball resumed, he was one of many players who was out of work. Johnson joined the group of unemployed players at a camp in Homestead, Florida, organized by the Major League Baseball Players Association. The Cubs signed him, but he did not hit well (in 169 at-bats, he managed just a .195 average), and his big-league playing career was over. At least Johnson went out with a bang, going 3-for-4 in his final game, with a single off Todd Jones in his last major-league at-bat. He went to play in Venezuela that winter, but nobody picked him up for the 1996 season, and he took a minor-league coaching job with the Butte Copper Kings, a rookie-league club of the Tampa Bay Devil Rays, who would begin play in the major leagues in 1998. One overarching aspect of Johnson’s career was his seeming need to be appreciated, and when that happened he performed well. Sparky Anderson clearly had little respect for Johnson, and it seemed to affect his play. Davey Johnson treated him with a lot of respect, but for his first two years in New York, the manager could not play HoJo full time because he also had Ray Knight. Once Knight was gone and Johnson won the job in spring training of 1987, and kept the job even when he got off to a slow start, he could relax, and he became a star player. As his performance deteriorated and his career with the Mets ended in the early 1990s, Johnson lamented that the people who had known him during the glory years with the Mets were gone and the new people did not have confidence in him. Johnson was hired by the Mets as a scout in October 1997, a position he held until he was named hitting coach of the brand-new Brooklyn Cyclones of the short-season A-ball New York-Penn League in late 2000. He was promoted to manager of the Cyclones for the 2002 season and managed the Mets’ Florida Instructional League team that season. He progressed through the Mets’ system as a hitting coach, working for the Port St. Lucie Class-A club in 2003, the Double-A Binghamton Mets in 2004, and the Triple-A Norfolk Tides in 2005 and 2006. He was promoted to first-base coach for the Mets for the 2007 season, and on July 12, 2007, he was named the hitting coach for the Mets, a post he held through the 2010 season. Johnson left the Mets following the firing of Jerry Manuel, the Mets manager. He was offered a couple of minor-league posts but he declined. Johnson returned to coaching in 2013 as hitting coach for the Tacoma Rainiers, the Seattle Mariners’ Triple-A farm club. In 2014 he was promoted to the Mariners staff as hitting coach. Midway through the 2015 season Johnson was reassigned to the Mariners farm system. This biography is included in the book "The 1986 New York Mets: There Was More Than Game Six" (SABR, 2016), edited by Leslie Heaphy and Bill Nowlin. An earlier version appeared in "Detroit Tigers 1984: What A Start! What A Finish!" (SABR, 2012), edited by Mark Pattison and David Raglin. 1 Joseph Durso, “Scouting; New Met Asks What’s in a Name,” New York Times, January 18, 1985. 2 “The Notebook,” The Sporting News, November 13, 1989: 50. 3 “Corked-Bat Charges ‘Insulting My Talents,’ Says Mets Johnson,” The Sporting News, August 17, 1987: 16. 4 Joseph Durso, “Mets are Beaten by Giants in 10th,” New York Times, August 20, 1987. 5 “A Corked Bat? Well, Maybe,” New York Times, March 27, 1997. 6 Dan Castellano, “Manager Lights a Fire Under Hojo,” The Sporting News, April 4, 1988: 40. 7 “Gwynn Spins Refreshing Tale in Final Month,” The Sporting News, September 16, 1991: 14. 8 Buster Olney, “Johnson Returns to Cheers of Fans,” New York Times, March 26, 1997.